Every man who has been married will tell you just how significant choosing the right suit for your wedding day is. 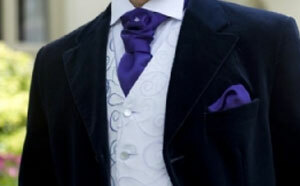 Of all the occasions and events that require a suit to be worn, your groom suit will be the most important. A wedding suit can come in many different styles, fabrics, colours and fashions, the outfit you opt for may seem like a good idea on the big day but may you may not feel the same way in years to come as you look back on wedding photos. It is best to keep your choice of outfit a traditional as possible albeit with a touch of contemporary; velvet suit hire is the perfect option to provide just this. Each option is excellent for weddings and the choice you make will largely depend on personal preference. The lounge suit is probably the most popular of all velvet suits and is ideally suited not just to weddings but to a whole host of different occasions. The single-breasted jacket and matching formal trousers are ideal in any situation and opting for the colour black will be perfect for black-tie events, school proms and banquets. The tail suit is an ultra-formal type of dress that is suited to a traditional wedding. This type of coat is cut away at the front leaving it longer at the back. It is worn with matching trousers, a white shirt, cravat and waist coat and the velvet fabric will add a touch of class to a wedding ceremony. The Nehru suit is the perfect blend of Eastern and western suit and is very common amongst British Indians. Velvet suit hire in the Nehru style will be perfectly suited to any occasion in any colour. The Nehru is unlike the common western suit in that it comes with no collar or lapels; the suit can be chosen with or without buttons and worn with tight-fitting trousers.